Mom's Gone Bronson! : Summer Essentials: Carmex Moisture Plus Lip Care! I have incredibly dry lips all year around, but summer brings on a whole other level of discomfort and one of my go-to loves for the season is Carmex. 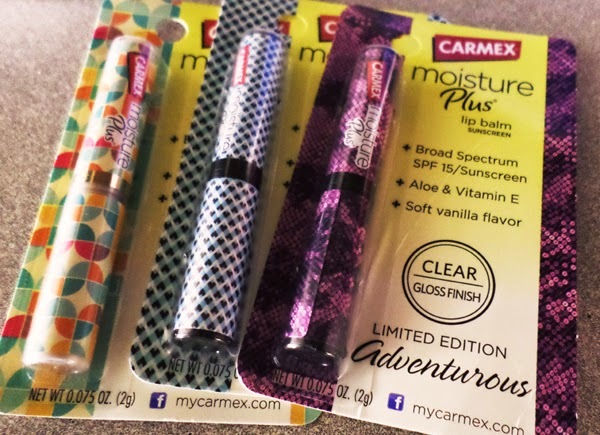 I love plain, regular Carmex for lips and so when I saw the Moisture Plus lip balm with these adorable, stylish designs I knew they would suit me down to the ground and right back up again! Busting with Aloe & Vitamin E, supplying a SPF 15 and presenting a soft vanilla flavor, these limited edition covers come ready to accompany you on any adventure in a design that suits your immediate need! With names like Chic, Fab, Whimsical, Adventurous and Starlet, you can add a little moisture to your lips and color to your purse with one of these lip-savers! To check out more from Carmex (and to stock up on your supply before they're gone), why not head on over HERE! You can also find Carmex on Twitter, HERE to make your feelings known! Disclaimer: I was given product in return for an honest opinion. All views are my own and your views may differ. No additional compensation was collected for this post. Thank you!